A short interview about our Halloween comics appears in Jen Vaughn’s Halloween blog post at The Beat. MONTPELIER – Tim Newcomb has satirized four sitting Vermont governors over hundreds of political cartoons during his 25-year career – and he usually always feels bad about it afterward. One cartoon this year showed Republican Gov. James Douglas in a rubber boat literally riding a wave of national party contributions soon after vetoing a bill that would place new limits on campaign fundraising. Newcomb’s Douglas takes key traits from the real-life politician and transforms them into exaggerated quirks as the cartoon version sports just a wisp of hair, a thin frame and oversized glasses across a childlike face. Read the rest at the Times Argus Web site. Between the publication of NEW STARS and my trip to SPX, I totally forgot to post my recent profile of Vermont cartoonist Edward Koren. 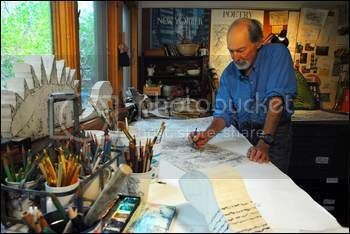 For 40 years, Koren has been one of the most popular NEW YORKER cartoonists to draw comics in a small single box. He’s receiving the Governor’s Award for Outstanding Achievement in the Field of, er, I mean the Governor’s Award for Excellence in the Arts at the Statehouse in Montpelier, Vt.
Edward Koren’s little creatures – furry, monstrous things with horns, large teeth and wide eyes – are all over his home in the quiet, off-the-beaten-path village of Brookfield. They’re printed on the tiles of his kitchen counter and they hang in numerous portraits on the walls. He’s drawn them on scraps of paper that are now stuffed in the corners of his busy art studio and has carved them from wood, giving these little monsters a three-dimensional, lifelike quality. “They’re extreme, they’re aggressive, they’re horripilations,” Koren says with a sharp smile when asked to describe the unidentifiable creatures that often pop up in his single-panel cartoons. Just don’t call them cute. Despite his contempt for the blandly endearing, Koren – who has spent 45 years drawing cartoons for The New Yorker – is a chatty, likable and polite man whose comics, although satirical and pointed, could hardly be considered mean or menacing. Koren, 71, started his career as a cartoonist in New York City, but nearly 30 years ago moved to a spacious 19th-century home in the heart of Brookfield, a central Vermont town of about 1,200 that is known mostly for a floating bridge rather than as the inspiration for one of the most celebrated cartoonists working today. That geographical move has infused Koren’s work with characters and quirks inspired by his new surroundings. Astute readers will notice Montpelier-area restaurants as settings or the name of a local school or community group on a character’s shirt. Koren will be honored for his artistic contributions when he is given the 2007 Governor’s Award for Excellence in the Arts this month. Koren was born in New York City and attended the private Horace Mann School and Columbia University, where he honed his cartooning skills while drawing for the college’s humor magazine, a sort of 1950s version of the famous National Lampoon periodical. At the time, Koren aimed his wit and pen at what he and some peers decided was the greatest threat to the academic institution: the college president’s plan for students to volunteer part of their time in the community as a requirement for graduation. Koren believed that would distract the students from their academic work, which he considered their mission there at the college. But his outlook on that issue has clearly changed over the years. Today, Koren exemplifies the ideal Vermont citizen. For 19 years he has been a volunteer with the Brookfield Fire Department, including several years spent as its captain. He helped raise money to renovate the community’s historic town hall and often donates art for fundraisers by organizations including Vermont Public Radio. Koren got his artistic break in May 1962 when The New Yorker accepted one of his cartoons. This one featured a sloppy-looking writer, cigarette dangling from his lips, sitting before a typewriter. Printed on his sweatshirt is one word: Shakespeare. That comic launched a lifetime freelance relationship between Koren and The New Yorker. After several years of continued publishing, he quit his teaching job at Brown University and devoted himself full-time to cartooning. Koren says his art started out in a more traditional style. But over the years, in a move he says was more subconscious than intended, he developed the scratchy, etching-like style that he has become renowned for. 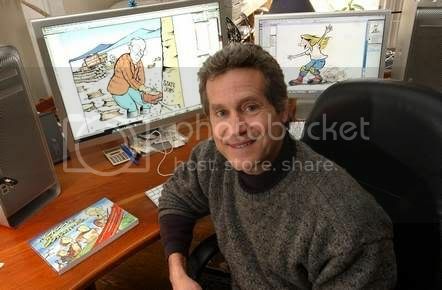 In an era when cartoonists are now doing much of their work on computers, Koren still draws by hand, using pencil and pen, in his cluttered and darkened studio space on the first floor of the family home. He and his wife are now empty-nesters. Koren says he is a constant doodler, and his art – drawn on scraps of paper or whatever else was handy at the time – sits in piles on the two drawing tables in the studio. Posters he created for benefit concerts 20 years ago are piled next to the art he drew just last week. His bookshelf is filled with collections of famous and forgotten cartoonists; underneath his drawing tables are shelves full of his own work, nearly all of which he has kept over the years. To fix his artistic mistakes, Koren uses an eraser nub and a razor blade, which can scratch out a regretted thin line. He also draws on paper too large to scan into a computer and instead mails his work to The New Yorker. Koren’s early comics focused on upper-middle-class life in the city. They still do sometimes, but his work now has a purely Vermont flavor — beat-up trucks with shaggy dogs riding in the back, overalls and baseball caps. Koren says his cartoons can be appreciated both by the city types who are typical of The New Yorker’s audience and his neighbors and friends here in Vermont. Similarly, he finds jokes in both conservative and liberal positions. Asked about his political beliefs, Koren first describes himself as a “left-of-center Democrat, but not a full-blown Progressive.” But he also describes himself as a social conservative. Wary of sounding like a cranky curmudgeon, Koren still says he is greatly concerned with what he calls “the general dumbing down of the population.” It’s disappointing that the younger generations are watching TV or playing video games instead of reading books, the local newspaper or, yes, cartoons, he says. Although he knows some might still refer to him as a flatlander, Koren sees himself now as a true-blue Vermonter. He still returns to New York several times a year, yet says he doesn’t feel at home anymore among the lights of the city. While the place he calls home has changed, Koren’s muse has not. People, as always, are his inspiration. Edward Koren will receive the 2007 Governor’s Award for Excellence in the Arts in a public ceremony Oct. 26 at 4 p.m. at the Statehouse in Montpelier. The award is given each year to a Vermont artist who has achieved national or international stature for advancing his or her art form. Newsarama has an interview with Center for Cartoon Studies co-founder James Sturm about Satchel Paige: Striking Out Jim Crow, his new comic with Rich Tommaso. You can read it right here. Howard Cruse is launching a new free publication on August 1 – click the image for details on that day’s launch party, sure to be remembered as a historic event! Read more about the origin of the Perp at Howard’s blog. While you’re reading cartoonists’s blogs, check out Marek Bennett‘s ongoing series chronicling his whirlwind summer teaching comics to kids over at his blog. Then head over to comics podcast Indie Spinner Rack to hear Marek interviewed during their MoCCA coverage. He’s about an hour in, a ways after noted Vermont cartoonist Alison Bechdel (herself a prolific blogger, as you know if you’ve been watching our blogroll down to the right).